Lavinso Natural Charcoal Teeth Whitening Powder has activated carbon which is famous to absorb all the contamination. It can whiten the teeth in just 30 days and it is also suitable for sensitive teeth. 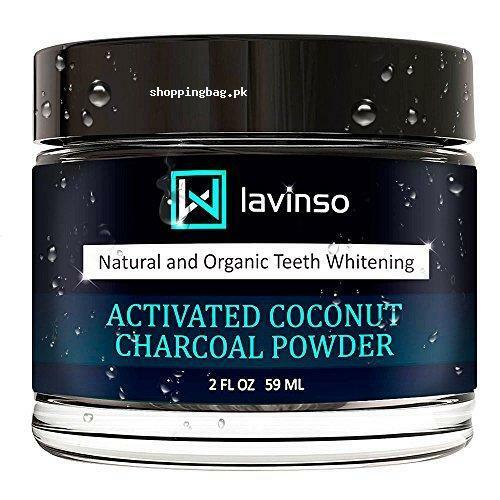 Economical size of Lavinso Natural Charcoal Teeth Whitening Powder is found in the collection of Amazon imported products in Pakistan and you can buy this amazing coconut and charcoal powder blend from online shopping in Pakistan. You can remove all the marks and stains from your yellowish teeth and make them white by regular usage of Lavinso Natural Charcoal Teeth Whitening Powder. Place your order now and get high quality whitening powder at your doorstep. CREATE A PERFECTLY WHITE SMILE - Use Lavinso activated coconut charcoal powder for your teeth daily for 30 days and see results! Teeth whitener without any chemicals or other dangerous substances. Made in the U.S.A. SUITABLE FOR DAILY TEETH BRUSHING - 100% Natural, 100% vegan components and special formula with organic coconut activated charcoal powder and bentonite clay are safe even for extremely delicate and sensitive teeth. ECONOMICAL PACKAGE - A large volume of 2 oz. (59 ml) that can be used up to five months. Use coconut activated charcoal powder along with or instead of your toothpaste. BEST NATURAL TOOTH WHITENER - Lavinso teeth whitening charcoal powder that removes coffee stains and traces of bad habits from your teeth and detoxifies your mouth. FOR EVERYONE - The natural charcoal tooth powder is perfect for anyone at any age. A perfect smile gives people the confidence they need. Important: If you experience any increased tooth sensitivity or irritated gums, stop using immediately and contact us for a full refund.